::: Off the Radar :::: Feliz Navidad Amigos! Here some music to play as you open your gifts from Santa. It's a mix of some of my favorites and a couple of new ones from this year (Cepia from Ghostly). Mix up your traditional playlist a bit. New interpretations of old songs can breath new life into traditions! And some of course should be played unchanged. Yeah, um. About those year end lists... How does that song go again? Should old acquaintance be forgot,and auld lang syne? 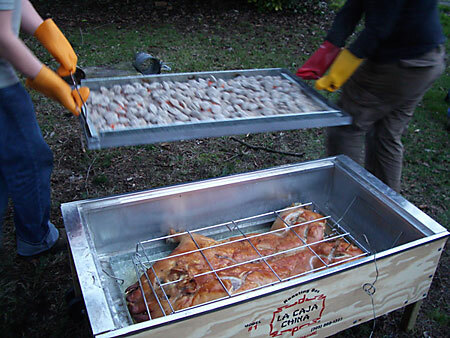 And for those that don't know... La Caja China (literally the chinese box - don't know why it's called that) is a requirement for all Cuban Christmas eve dinners. The coals go over the pig and my family will general fight to get the first piece of chicharron. It is similar (but obviously easier) to digging a hole in the ground and cooking the pig in a pit.